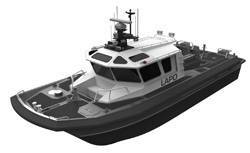 Moose Boats, has been awarded a new contract from Los Angeles Police Department for the construction of a M1-46 Catamaran Dive Boat. The M1-46 all aluminum catamaran will be powered by twin 600hp Cummins diesel engines coupled to twin Hamilton 322 water-jets and Hamilton Blue Arrow Controls. The boat features a fully enclosed cabin complete with three shock mitigating seats, galley, dinette, head, shower and a workstation for ROV piloting, surface-supply air monitoring and Diver Recall System operation. The 46 foot catamaran offers an extended cockpit with a large dive seat, stowage for 12 dive tanks and an additional aft Hamilton Blue Arrow Station for use during dive operations. The City of Los Angeles utilized a Fiscal Year 2010 Port Security Grant Program award to purchase the Moose Boats M1-46’. The vessel will operate in the waters from the Port of Los Angeles north to Pacific Palisades and will become a significant proponent of the Port Dive Operations Group within the Port of Los Angeles and Long Beach. At 46 feet in length, the M1-46 is the largest vessel of the Moose Boats fleet to date.